An experiment in production as well as narrative, Objects Attack is the story of Lovey Chambers [pictured above] a passionate but incompetent woman who, after undergoing hypnosis, finds herself in the midst of a resistential crisis. 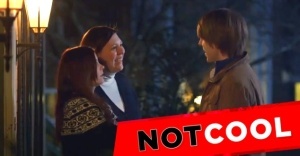 Not only are the objects confounding her, but her boyfriend has vanished and been replaced by an exact duplicate (who doesn’t seem to recognize her.) Desperate to find love and restore order to her chaotic life, Lovey must uncover the source of the objects’ anger – and there is a shoot-out with a psychotic cowboy preacher. Objects Attack! is a feature filmed entirely on Super 8. 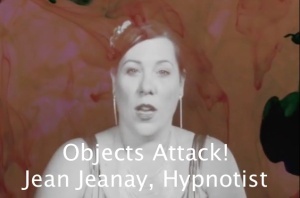 In this clip, Jean Jeanay shows her hypnotism mastery. Set in the deteriorating vistas of post-steel Pittsburgh, Strange Girls dissects the rotten underside of female relationships: the horror, manipulation, claustrophobia, violence, and obsession of two women who cannot stand to live together but cannot live apart. In the clips below, Marci Maguire terrorizes the murderous twins, only for them to enact their revenge.